Inject a little joy into hectic weekday mornings with a fluffy, chocolatey breakfast treat. 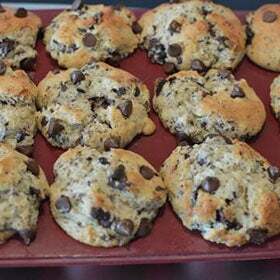 These chocolate chip muffins mix up fast and make most important meal of the day both tasty and easy. Bake a batch on the weekend and freeze them for a grab-and-go meal that will put a smile on your face and keep you nice and full until lunch. Preheat oven to 425°F and either grease a muffin tin or line with cupcake liners. Set aside. 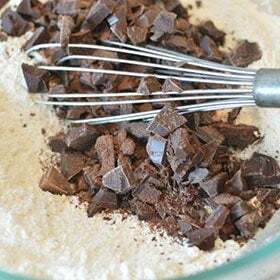 In a large bowl, mix together the dry ingredients: flour, sugar, baking powder, salt, spices and chocolate chunks. 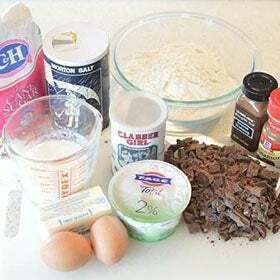 (You can use chocolate chips, but chocolate chopped into different sizes spread out the chocolate flavor better.) Set aside. 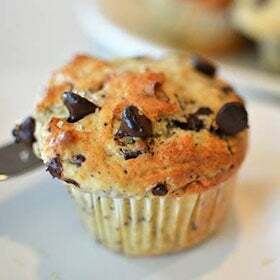 * Add spices for a more sophisticated muffin flavor. Omit for a more traditional taste. 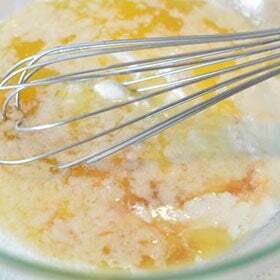 In a medium bowl, whisk together the wet ingredients: butter, eggs, buttermilk, yogurt and vanilla. Don’t have any buttermilk on hand? Simply add a tablespoon of fresh lemon juice to regular milk and let it sit for a couple minutes before using. 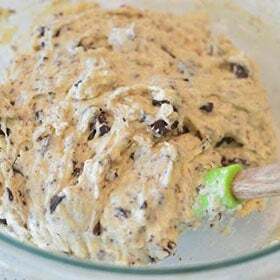 Fold the wet mixture into the dry until just barely combined. The more you mix, the more dense your final muffin will be, so don’t overmix! 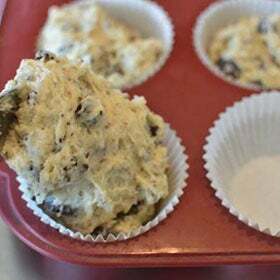 Scoop batter into your prepared muffin tin, filling each cup to the very top, to ensure your muffins have nice, domed tops. You will have exactly the right amount of batter for 12 muffins. 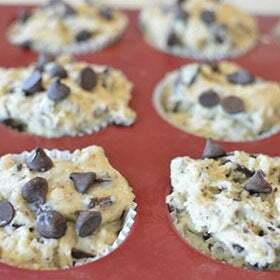 For an extra chocolate boost, sprinkle the tops of your muffins with some chocolate chips or extra chocolate chunks before putting them in the oven. Cook at 425°F for 5 minutes then reduce the oven temperature to 375°F and cook for a further 20-25 minutes. Check muffins for doneness by inserting a knife or toothpick into the center of one of the center muffins. Knife or toothpick should come out clean, or only coated in melted chocolate. Enjoy warm or allow to cool fully before freezing.